The Wise Hippo Birthing Programme is a complete 10 hour programme which Bex runs over 12 hours as 4 x 3 hour classes at a time and day that suits your busy lifestyle. You will receive a workbook that supports each session and sets out the homework and 6 x mp3s are also provided to our expectant clients to support your practice at home. The next step is to start busting any negative beliefs pregnant women and their partners may have picked up about birth. And there are lots of things that cause fear for women and their partners aren’t there? How they are going to cope with the pain. And one of the biggest fears – feeling out of control. Because this session is about making sure that women and their partners feel CONFIDENT about birth, without making them think that we have a magic wand that will guarantee them a perfect birth. Clients who have attended this session share with us that they have a restored faith in their ability to handle birth no matter what happens on the day. To help our clients bust any negative beliefs they might have about birth and feel more CONFIDENT instead we teach them The Birth Belief Generator™. For this I have identified 6 important steps that explain how the mind and body work. Which means that during this session, our Wise Hippo clients are able to understand why so many women report negative experiences of birth, and why it doesn’t have to be that way. They also learn how their minds can be negatively influenced by others, without them even knowing it, and a way to protect themselves from that. But it isn’t only other people they need to be aware of in relation to this. so, they also learn how to avoid being their own self-saboteur as well. Once our clients have learnt and understood these 6 important points. they find that their negative beliefs have been transformed into a self-belief that they can birth with confidence. in a way that is right for them. The Birth Belief Generator™ moves our clients from feeling scared and out of control to feeling CONFIDENT about birth. This session is vitally important because without it, their new-found self-belief acquired in the first two modules will not be sustainable. But here’s the thing, just making sure that pregnant women and their partners are feeling confident about birth is not enough. Because most of life isn’t controllable, is it? Things may arise during labour and birth, that could cause a woman and her partner to feel stressed and anxious. So, would you agree that it is important to give them tools to handle that too? It is crucial for them to feel confident in their ability to remain CALM, relaxed and in control, and to feel able to avoid any panic setting in on the day, should something unexpected arise. Clients who have attended this session love the fact that they are given tools and techniques for remaining CALM and relaxed during labour and birth, that they can practise and use in everyday life too. Without the peace of mind that comes from knowing that they can be CALM in any situation, that they can remain CALM no matter what happens during their labour and birth, they may not be able to maintain their confidence in their ability to have a positive birth experience. That is why I have included 5 simple yet powerful techniques in this module, to help our clients, prevent any stress or anxiety from being a part of their labour and birth. These 5 important tools available in The Balanced B.R.E.A.T.H.S. Toolkit™ are essential for ensuring equilibrium throughout labour and birth, but are also great tools for life, to use during pregnancy and as a new parent too. So far we have discussed the importance of pregnant women and their partners knowing how to remain calm, relaxed and in control no matter what happens during their labour and birth. And that is great but there’s something else that clients share with us a lot and that is the fear of the unknown. Even if this is not their first baby, they share that they have concerns about not knowing who will be with them at the birth, or they might worry about what the environment is going to be like, or worse that decisions will be made about their baby’s birth that they don’t fully understand. Things like that. And the biggest problem with all of this is that no-one can know what they don’t know, which is not conducive to making informed choices, and what I mean by informed choices is making decisions based on having looked at all sides of a situation. But some people don’t know that they have options, or they don’t take time to explore their options and are therefore pretty much left with going with what they are told to do, even if it doesn’t feel right for them. There are in fact so many things that women and their partners can choose to do to help make their birth the best it can be, when they know what they are. Which is why it is crucial for women and their partners to take the time to CONSIDER what those options are so that they can make choices that are right for them. If they don’t take the time to do this other people will end up making those choices for them instead. I am sure you will agree that it is good to have a set of tools to help you remain calm, relaxed and in control, but that means nothing if you are forced down a path in relation to your labour and birth that doesn’t feel right for you. Which is why The Birth S.P.A.C.E. Planner™ is so important, as it enables our Wise Hippo clients to fully explore and CONSIDER what it is that is important to them for their baby’s birth. Because everyone is different, aren’t they? What you may want for your baby’s birth maybe completely different to what somebody else may want for their baby’s birth. But unless you take the time to CONSIDER all of your options, you may not even know that those options exist, until you find yourself having had a birth that doesn’t feel right for you at all. Which is why during this module you will go through the 5 key essential areas of The Birth S.P.A.C.E. Planner™ in order to CONSIDER the questions that you might want to ask, the research that you may want to make, and the choices that are right for you. Now of course the birth of a baby is something to be celebrated, isn’t it? But shockingly some people believe that as long as there is a healthy baby and mum then that’s all that is important but that simply isn’t true. The fact that women are sharing difficult stories of birth tells us this isn’t true, and the fact that the Birth Trauma Association approximate that over 200,000 women a year are traumatised by birth, shows us that isn’t true. So just to focus on a healthy mum and baby, however important that is, is absolutely not good enough. But as life isn’t always predictable no amount of preparation will guarantee a perfect result. Which is why it is crucial for pregnant women and their partners to be able to CELEBRATE the way their baby is born, not only when they have their perfectly dreamed of birth, but also if all of their best laid plans go completely out of the window. After The Birth S.P.A.C.E. Planner™ module you will have all the necessary information to put together a well thought out and considered birth plan. But there are some people, and you may have already come across them, who will say to you “but you can’t plan birth”. And if they are thinking that by planning I mean a rigid set of rules, carved in stone that you will insist upon no matter what, then let me assure you that this is not the case. Your plan is there to show your health care providers what is important to you for your birth, because would you agree with me that they are not mind-readers? But your birth plan is based on everything going as you hope, and there is a potential problem with that because life doesn’t always go as you hope does it, sometimes it throws some mean old curve balls around and you want to know that you can handle those too don’t you? 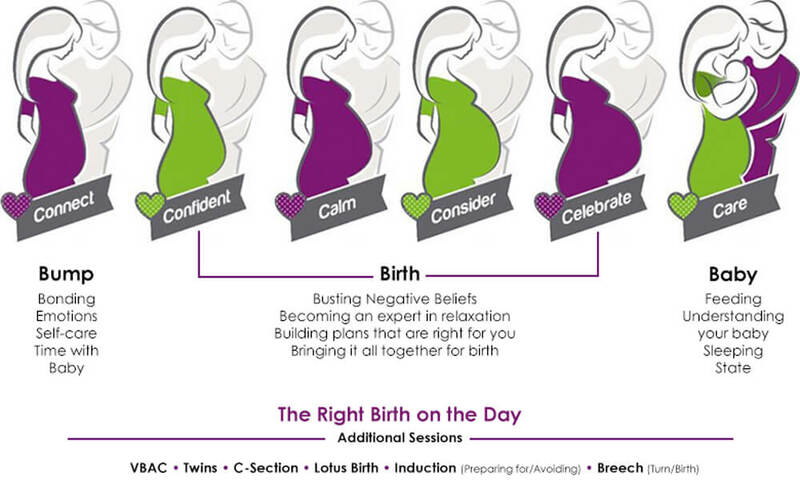 This is why The Flexible Birthday Formula™ is such a crucial part of your birth preparation because the 5 steps within this module show you how to have ‘the right birth on the day’. Which means that no matter what happens during your labour and birth, you will know that you were a part of every decision and that every decision was the right one for you. This enables you to feel emotionally in control of your birth even when you should deviate from your hoped-for plans. The Flexible Birthday Formula™ helps our Wise Hippo clients avoid being traumatised by their baby’s birth even if things don’t go their way. The full Wise Hippo Birthing Programme is available as private sessions in your own home, please inquire to find out when the next course is available as space is limited and fill very fast due to current baby boom. Classes start a £497 and price is dependent on the location. A £100 non-refundable deposit is required to secure your place with full balance settled four weeks before you start the programme if at my venue and two weeks before if you are having private classes at home. Please also see the terms and condition of the services provided. Did you know you can have paid time off work for antenatal classes?